Hi everyone! Welcome to Mrs. Lincoln's Inkin'! Today's share is super simple and super quick:) This is another birthday card that i made for the month of January and my clan of birthday's that my family celebrates. My card measures average size of 4 1/4" x 11" and then scored at 5 1/2" and is using the Whisper White. I then took another piece of Whisper White and cut it 1/4" smaller all the way around, therefore 4" x 5 1/4". I took a piece of computer paper and cut an oval shape using my Oval Framelits and then a sponge and some Soft Sky and Marina Mist ink and sponged inside the oval, when i lifted up the computer paper my inked oval was on the piece of Whisper White. Pretty simple but oh so pretty!! 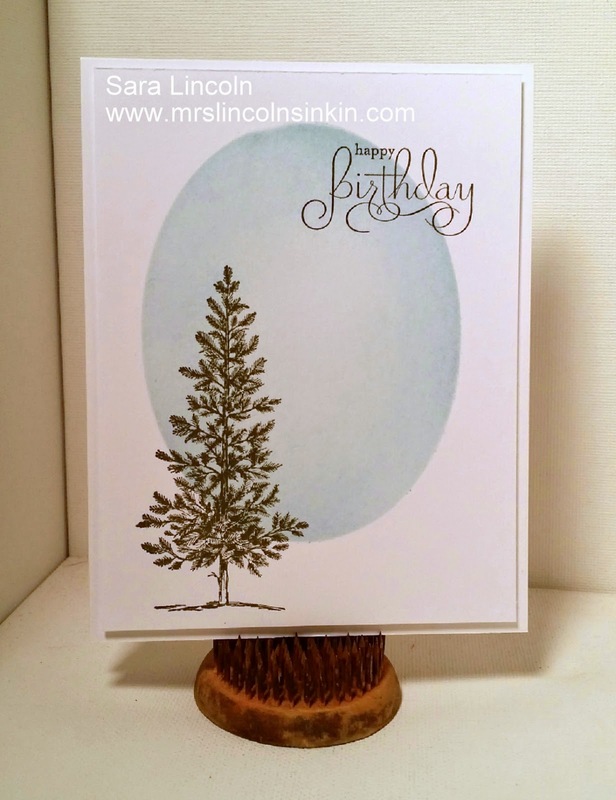 I then used the stamp set Lovely As A Tree and used the pine and off centered it and dropped it down so it wasn't even with the colored oval. LOVE IT! The Lovely As A Tree set is my all time favorite set and has been in the SU! Annual Catalog for ever!! It's an oldie but for sure a goodie! !